Creating beautiful and functional smiles. Click on each image to learn about the service. If your teeth are cracked, chipped, or discolored, then dental veneers may be the ideal option for you! 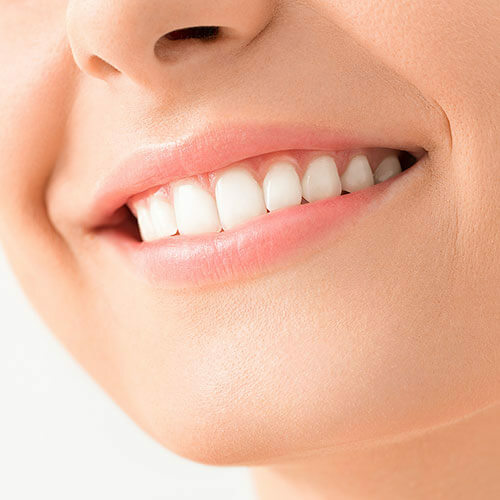 Veneers are thin shells created using a biocompatible and durable material called porcelain. This material mimics the appearance of natural teeth and is stain-resistant. The process involves your cosmetic dentist removing a small part of your tooth’s structure so the custom-made veneer can be placed over the top of it. When designing the veneer, we take a digital impression of your teeth and then use 3-D technology to create a veneer that matches your specifications. The veneer is made using a CEREC® milling machine and placed by your dentist. 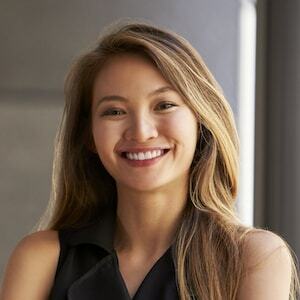 This innovative in-office whitening treatment is easier, quicker, and more effective than traditional at-home whitening kits. With Zoom!, we can brighten your smile by up to eight shades and do so in a single visit. Plus, this form of whitening lasts longer and does not damage your teeth’s enamel. To begin, we isolate your teeth from your lips and gums. Next, Zoom! 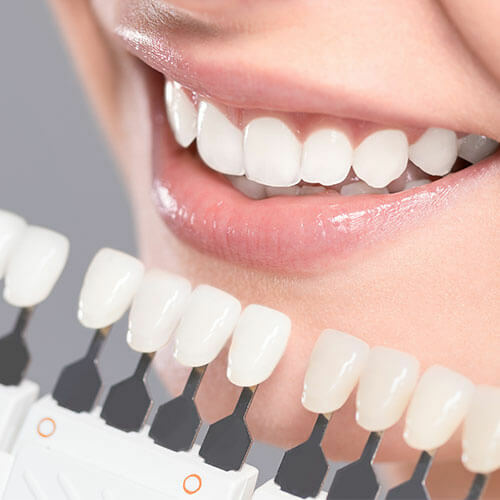 Teeth Whitening gel is applied to your teeth and a specially designed light is used to activate the gel. You can sit back and relax while we whiten and brighten your smile. Do you wish you could achieve a beautifully straight smile without the use of metal or braces? With Invisalign’s clear aligner system this is a reality! 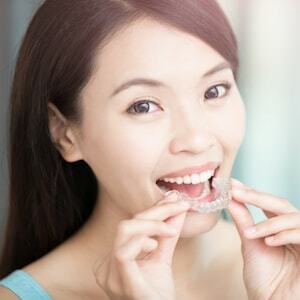 Using a series of removable, transparent aligners, Invisalign® gradually moves your teeth into the desired position. Invisalign® is convenient too as it allows you to eat, drink, brush, and floss as you normally would. Plus, they are custom-made to fit your smile – making them comfortable and effective. Visit our ADC dentist today and discover how you can improve your smile without any metal or wires. Dental bonding uses tooth-colored filling material (composite) to repair chipped or broken teeth, improve the appearance of stained or misshapen teeth, and close gaps between your teeth. This versatile material is applied to the affected tooth in layers and then shaped and polished to resemble your natural tooth. This treatment is aesthetically pleasing but also functional. The composite resin is strong, durable, and long-lasting. Dental bonding can really improve the appearance of your smile using a non-invasive yet worthwhile treatment. From the greeting upon arrival - a cheerful hello and no need to sign in to the final stop at the desk to settle the payment, Aesthetic Dentistry manages to be both highly efficient and exceptionally welcoming and friendly. There have been many advancements in modern dentistry and one of the most telling is CEREC® Same-day Restorations. 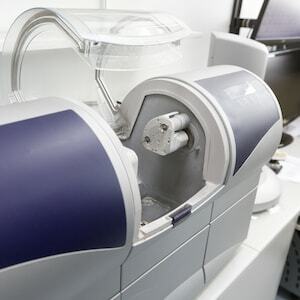 This wonderful piece of equipment allows our doctors to scan your teeth and take a digital impression, so no more sitting with a messy mold in your mouth. Once the impression is made the data is transferred to a 3-D computer where we use CAD/CAM technology to design the crown, veneer, or bridge. After we have finished this phase, the design is sent to the in-house milling machine where your restoration is created. The completed product is then carefully and skilfully placed into your mouth – all in one visit! All CEREC® restorations look great, are durable, and fit comfortably. Experience ultimate dental convenience with CEREC® Same-day Restorations. Crowns: If your tooth has become severely chipped, cracked, or broken then we may choose to repair it using a dental crown. This restoration is like a cap placed over the top of the damaged tooth. Crowns use a durable and tooth-colored material to preserve the natural look of your smile and restore the functionality too. Bridges: When you lose a tooth, a dental bridge may be the most efficient and cost-effective way to restore your smile. Bridges utilize your existing teeth to fill a gap left vacant by a missing tooth. The procedure involves fabricating an artificial tooth and anchoring it into place with your adjacent teeth or crowns. The supporting teeth hold the restoration in place and return function back to your smile. Gone are the days of unsightly silver or amalgam fillings as we usher in the new era of natural-looking, white fillings. These composite fillings are commonly used to repair your teeth and replace silver fillings – leaving your mouth mercury-free and metal-free. 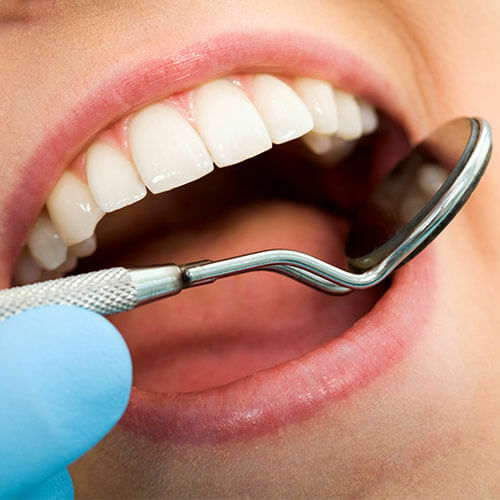 The simple process involves your dentist cleaning and numbing the affected area. He or she then fills the hole in your tooth with the composite resin and shapes it to fit your bite. The resin hardens and allows you to resume everyday activities. White fillings are safer, more durable, and blend in with your natural teeth. What’s more, these restorations bond better to your tooth and last longer than traditional fillings. A missing tooth can impact the way you smile, eat, chew, and speak. It can also lead to complicated issues such as teeth shifting and a misaligned bite. Dental implants have been designed to provide a solid foundation for replacement teeth that look and feel like your natural teeth. A dental implant consists of a small titanium post placed into your jawbone and topped with a crown or denture. The jawbone bonds to the biocompatible implant to provide a sound base for your artificial tooth. This helps preserve your facial structure, avoids bone deterioration, and restores the function of your natural teeth. Our team works closely with a local oral surgeon and periodontist who places the implant and ensures it integrates with your jawbone. Once the implant is established, our restorative dentists in Charlottesville, restore your smile with crowns or bridges. 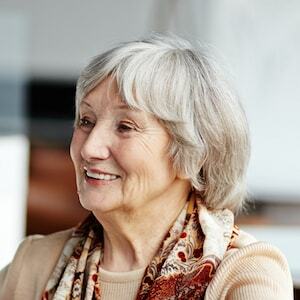 When you lose multiple or all natural teeth then dentures are a great solution to restore your smile. At ADC, dentures come in two forms: full and partial. Full: These dentures are placed when you have lost all your teeth on either the upper or lower jaw. 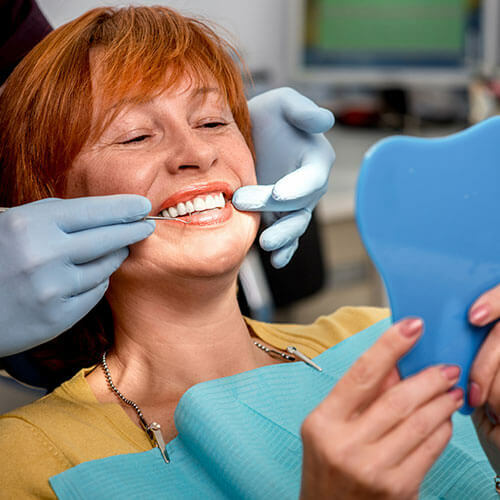 Your dentist takes impressions and fabricates beautiful, natural-looking teeth, which are fitted onto your gums. Partial: If you only have a few missing teeth, then a partial denture is created to fill in the gap. The dentures match your natural tooth color and restore the function of your smile. Root Canal therapy is also known by the technical term endodontics and is required when a tooth’s nerve becomes infected and inflamed. This can be caused by severe decay, trauma, or the inside of the tooth becoming exposed. When this happens, a root canal is the best form of treatment. 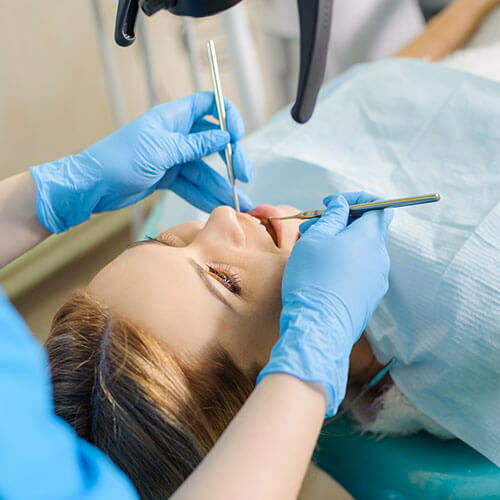 This procedure involves our dentist carefully cleaning the area and removing the bacteria from the inside of your tooth. Once the infection is cleared, the dentist uses a resin to fill the hole and protect your tooth. For more complex cases, we may refer you to a trusted endodontist. After a root canal, we may recommend a crown to restore the look and function of your tooth. 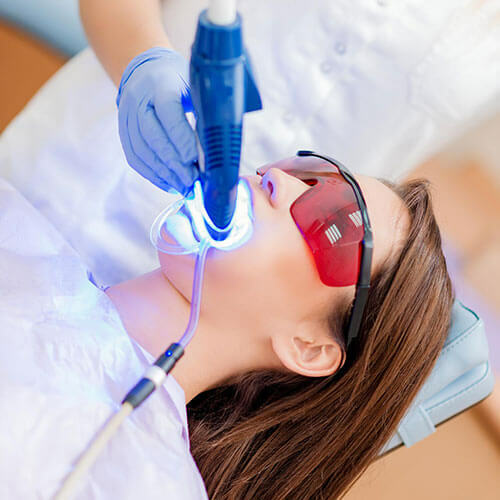 We use modern technology and equipment to reduce any discomfort and gently carry out the treatment. Occasionally when your tooth becomes extremely damaged or beyond repair, an extraction is the most suitable solution. This may also be the case to ease overcrowding caused by wisdom teeth growing at an angle. Although we carry out most of our extraction in-house, we may refer you to an expert oral surgeon for certain procedures. Extractions are a routine procedure, which can prevent serious dental problems developing and actually save you time, discomfort, and money. We begin by cleaning the tooth and preparing the gum tissue. Once removed, the area vacated by the tooth is cleaned and treated. After the procedure, we may recommend that your tooth is replaced with an implant (not performed in-house) or bridge. Beautiful, functional, and effective services for you.